The Deluxe Trail (or Snack) Mix is a meal in a bag. Black raisins, date pieces, sunflower seeds, papaya chunks, brazil nuts, dried pineapple nuggets, raw almonds, dried apricots, and sliced coconut keep you satisfied. Our fruity cranberry snack mix is loaded with sweet and flavorful dried cranberries, as well as dried pineapple nuggets, banana chips, raw almonds, and milk chocolate candy coated buttons. 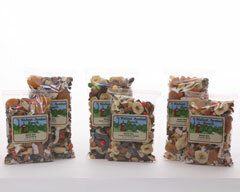 The Tropical Trail (or Snack) Mix has a more fruity and exotic slant. Contains date pieces, black raisins, golden raisins, banana chips, dried pineapple nuggets, papaya chunks, soft dried apricots, and sliced coconut.